The benefits of an effective start in competitive swimming cannot be underestimated. Evidence from race analyses conducted at major international competitions demonstrates significant correlations between faster start times and race times. Competition day is the day that every swimmer trains for. Although many swimmers and coaches place a tremendous amount of focus on what happens on race day, the hay is largely already in the barn, so to speak, and the meet is just where everything comes together to produce the ultimate performance. To begin this section, let’s first challenge some of the terminology that has been used in the field of sport psychology and offer a different perspective on the much-overused concept of mental toughness. Many open water swimmers train individually, but they race in competitions where they’ll be in the water with dozens, if not hundreds, of other athletes. Editors Riewald and Rodeo assemble many of the world’s leading swimming experts to reveal the latest in research, technology, training, and performance across the sport. 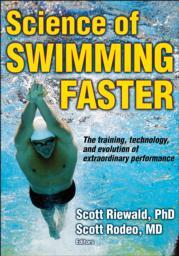 Authoritative and applicable, Science of Swimming Faster dives into the physiology, biomechanics, medicine, psychology, and training for swim performance while providing prescriptive advice along the way. Advanced-level competitive swimmers, serious fitness swimmers, triathletes, and coaches ranging from age-group to Olympic levels. Secondary audiences would include strength and conditioning coaches and medical professionals who work with swimmers as well as researchers who are interested in the latest swimming science.